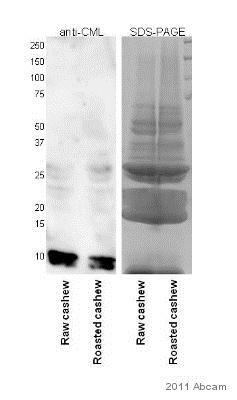 This antibody specifically binds to Carboxy methyl Lysine modified proteins. Carboxy methyl Lysine conjugated to KLH. This antibody was purified by Carboxy methyl Lysine protein Sepharose affinity column. Our Abpromise guarantee covers the use of ab27684 in the following tested applications. N epsilon carboxymethyl lysine (CML or Carboxymethyl Lysine) is formed by the non enzymatic Schiff base reaction of glucose with proteins, followed by an Amadori rearrangement and oxidation that leaves only a carboxymethyl group attached to the lysine. The levels of CML adducts accumulate over time and have been used as an indicator of both serum glucose levels and oxidative protein damage. Elevated serum CML modified proteins have been associated with diabetes and may contribute to diabetic retinopathy, nephropathy and angiopathy. ab27684 staining Carboxymethyl Lysine in Mouse lung tissue sections by Immunohistochemistry (IHC-Fr - frozen sections). Tissue was fixed with paraformaldehyde, permeabilized with 0.5% Triton X-100 and blocked with 5% serum for 1 hour at 25°C. Samples were incubated with primary antibody (1/1000) for 12 hours at 4°C. A biotin-conjugated anti-rabbit IgG polyclonal (1/500) was used as the secondary antibody. Publishing research using ab27684? Please let us know so that we can cite the reference in this datasheet. Needs positive control skin tissue slide to use with 4HNE and CML antibodies. Thanks for your call earlier this week and for your patience. 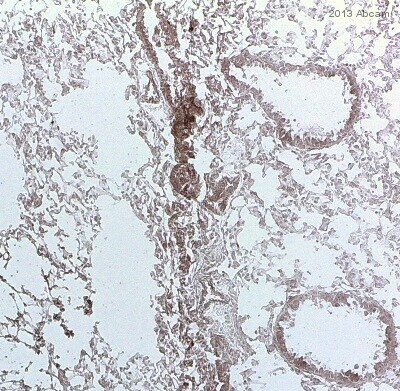 I have looked through some literature, and I think the best positive control for these markers that we will have are the human squamous cell carcinoma slides ab5107- https://www.abcam.com/Skin-tumor-human-squamous-cell-carcinoma-well-differentiated-tissue-slides-ab5107.html I hope this information will be useful, but please let me know if you have any questions and I will be happy to help. Thank you for your call yesterday and for our conversation about positive control to use with 4HNE and CML antibodies. I have searched through some literature but need a little more time to confirm that these markers will be expressed in certain skin carcinomas. I will get back to you tomorrow with more information. Please let me know if you need anything in the meantime. Dear scientific support: The customer would like to confirm predicted Mw of anti-Carboxymethyl Lysine antibody (ab27684). Because of multiple bands, She would like to realize which band is predicted. Could you please help her to solve this matter? Thank you very much. Thank you for your enquiry and your interest in our products. This antibody is not target specific; it recognizes any proteins which have Carboxymethyl Lysine groups. It may well be that the customers detects several different proteins. If you need any further assistance in the future, please do not hesitate to contact me.